Arctic Cooling also presents the Accelero Twin Turbo 6990, a new cooler designed for AMD's Radeon HD 6990. 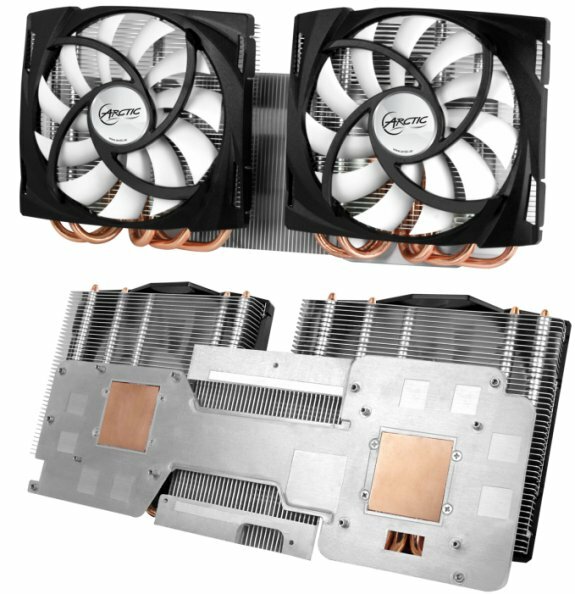 The company claims this product is the most powerful VGA cooler ever, it offers copper bases, ten 6mm heatpipes and 86 aluminium fin. Airflow is provided by two 120mm PWM fans with a spinrate of 400 to 1500RPM. The cooler measures 300mm x 138mm x 50mm (L x W x H) and weighs 820g. The price tag of $149.95 seems a little high though. The Accelero Twin Turbo 6990 is the most powerful VGA cooler ever. There is no reason to suffer from the stock cooler's enormous noise level any longer since the Accelero Twin Turbo 6990 offers superior cooling performance at a fraction of the loudness – a perfect solution for overclockers as well as silent enthusiast. Accelero Twin Turbo 6990 features two 120 mm PWM fans with a cooling capacity of 400 Watts. It has a built-in 86 aluminum fins heatsink with 10 copper heatpipes to deliver excellent cooling performance. This cooler ensures an enhanced overclocking performance and extended service life of this VGA graphic card. Accelero Twin Turbo 6990 operates with its maximum capacity at a minimum noise level of 0.4 Sone due to its two 120 mm PWM fans, low-noise impeller and patented fan holder. With the PWM control, the fan operates according to the temperature of the GPU whereby the fan stays at minimum speed unless otherwise necessary to increase the cooling performance. PWM settings can be modified according to your preference for cooling performance and noise level. Click here to see how the PWM settings work. Accelero Twin Turbo 6990 is unique solution for the AMD Radeon HD 6990 graphic card which provides an unmatched cooling performance for enthusiasts.